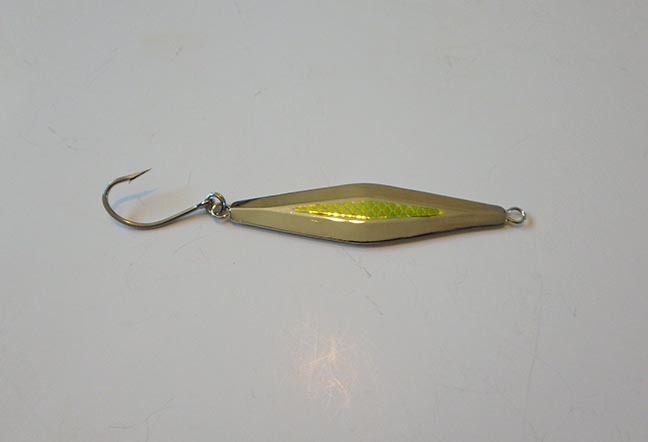 2.5 inch Chartreuse yellow rotator jig with green stripe with hook and bumper beads. Works great for kokanee coho, chinook, pink and blackmouth salmon too. Super albacore, steelhead, trout, rockfish and bass fishing lure. 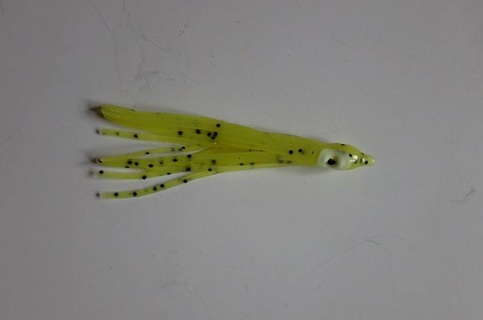 2.5 inch Chartreuse yellow rotator jig. Comes with hook and bumper beads. 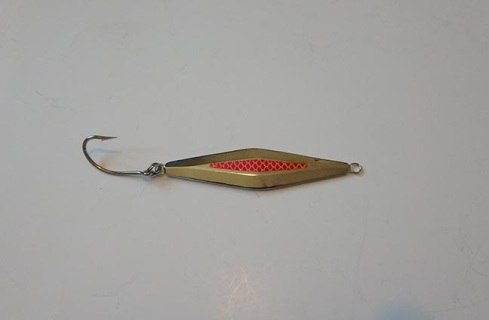 Exceptional lure for kokanee (landlocked sockeye salmon). 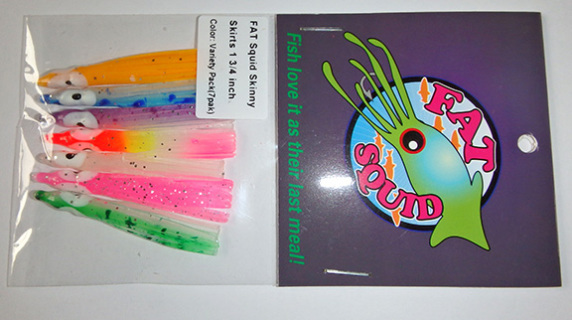 Works great for, coho, chinook, pink and blackmouth salmon too. Also super albacore tuna, steelhead, trout, rockfish and bass fishing lure. 2.5 inch chartreuse yellow rotator with UV stripe for greater visibility in the water. Comes with hook and bumper beads. 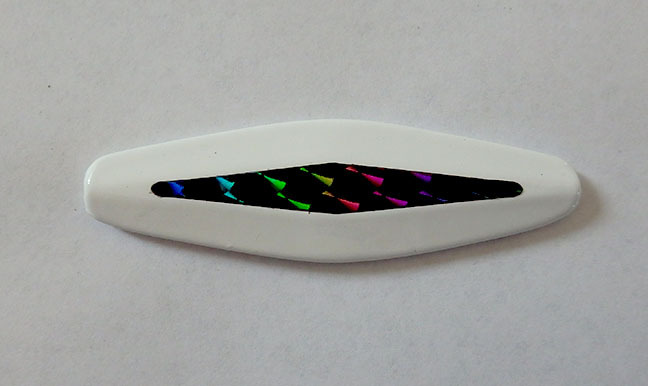 2.5 inch long white rotator with holographic dark stripe that catches colors in the right light. Comes with hook and bumper beads. 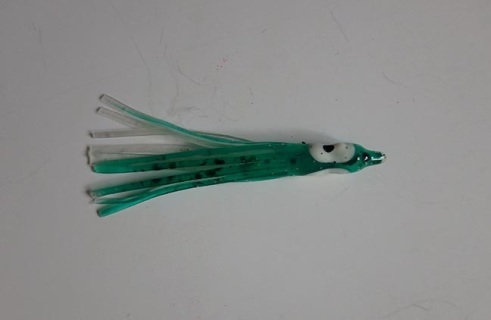 White rotator jig, 2.5 inches long. Comes with hook and bumper beads. Exceptional lure for humpies and kokanee. 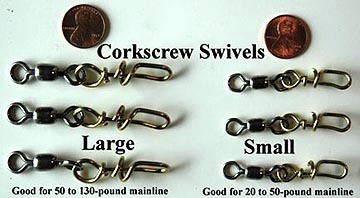 Works great for coho, chinook and blackmouth salmon too. Also super albacore tuna, steelhead, trout, rockfish and bass fishing lure. 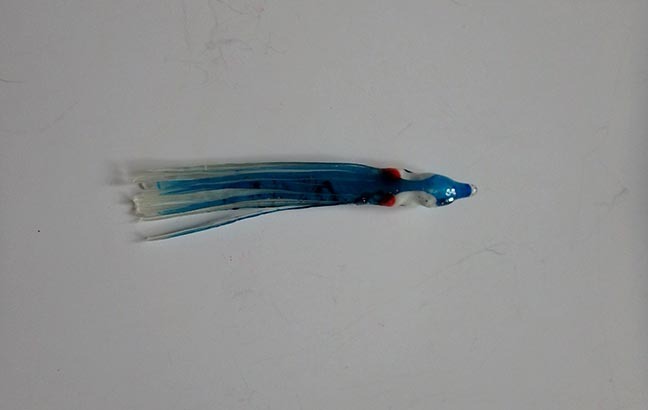 2 1/2 inch long white rotator jig with blue stripe. Comes with hook and bumper beads. Fish love it! 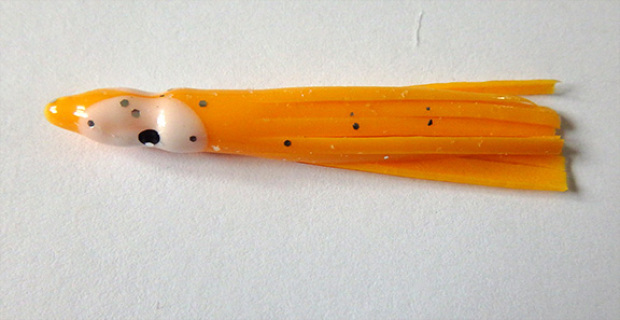 2 1/2 inch long white rotator jig with yellow stripe. Comes with hook and bumper beads. Fish love it! 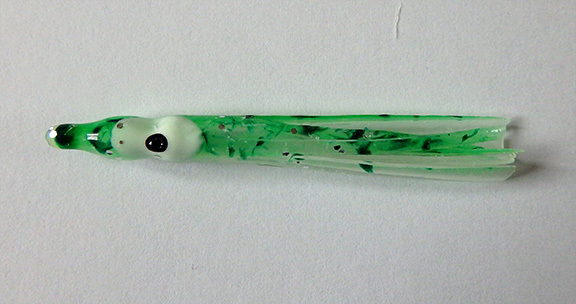 2 1/2 inch long white rotator jig with green stripe. Comes with hook and bumper beads. Fish love it! 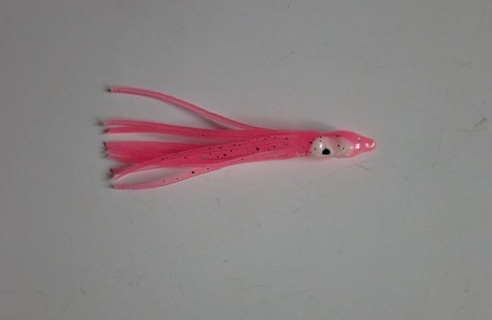 Pink rotator jig, 2.5 inches long. Comes with hook and bumper beads. 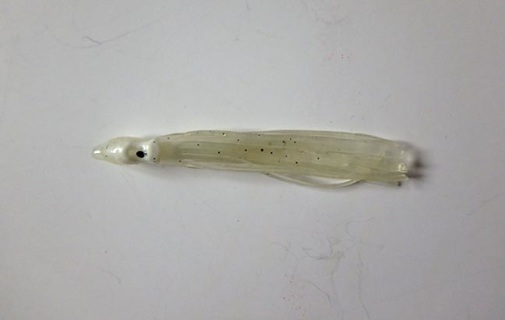 Exceptional lure for humpies. 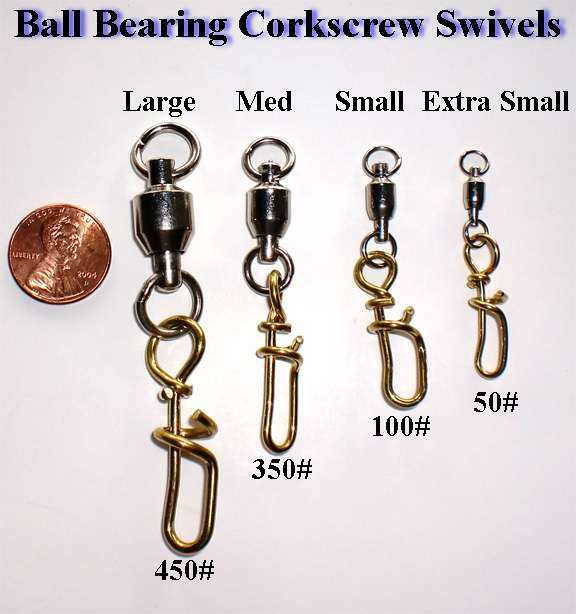 Works great for kokanee, coho, chinook and blackmouth salmon too. 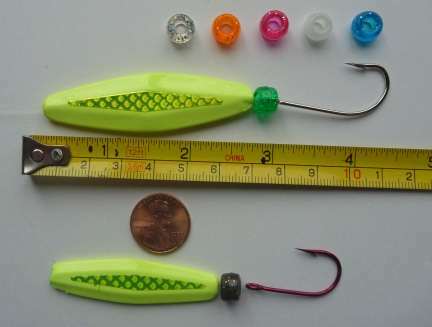 Also super albacore tuna, steelhead, trout, rockfish and bass fishing lure. 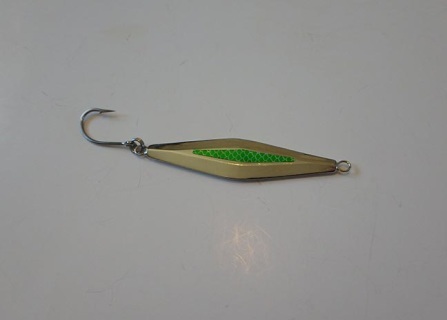 Nickel plated rotator jig with green stripe. 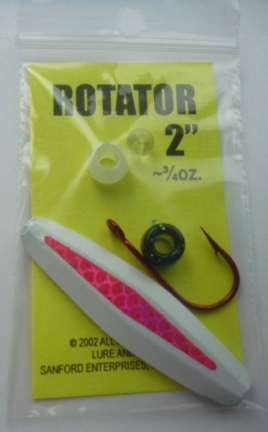 The rotator's spinning action entices fish to bite. Add scent to make your lure smell like dinner to the fish. 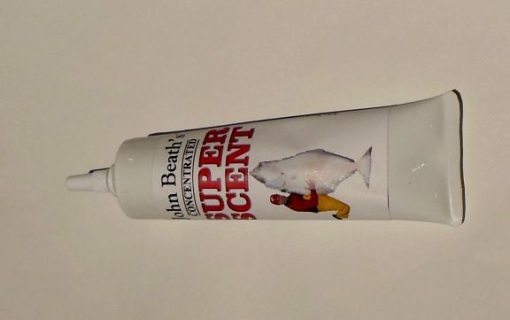 Super Scent Paste works well on any artificial lure. Chartreuse yellow rotator jig, 2 inches long with green stripe. Comes with hook and bumper beads. 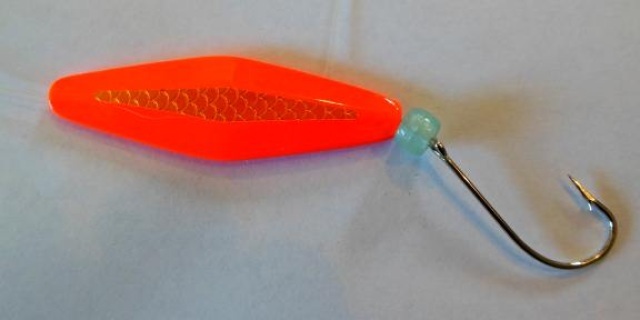 Exceptional lure for kokanee (landlocked sockeye salmon). Works great for, coho, chinook, pink and blackmouth salmon too. 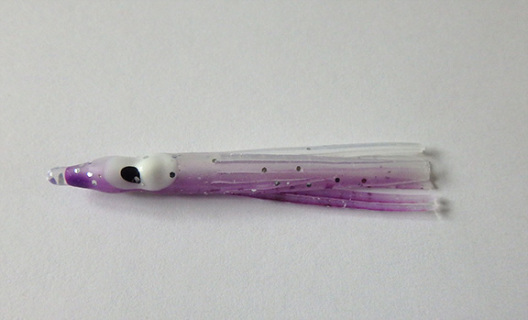 Also super albacore tuna, steelhead, trout, rockfish and bass fishing lure. 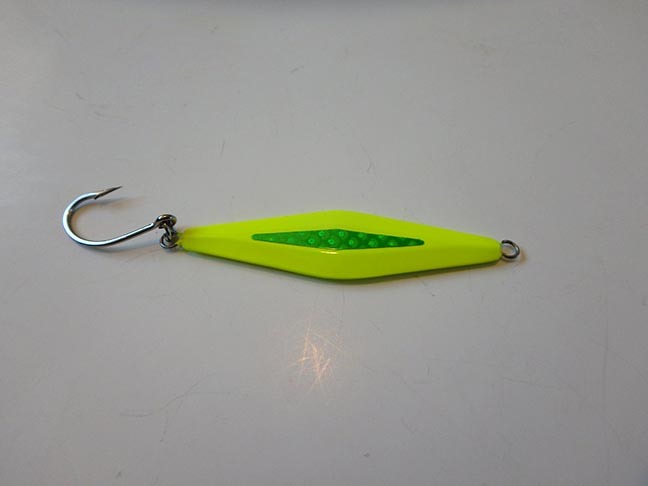 Chartreuse yellow rotator jig, 2 inches long. Comes with hook and bumper beads. 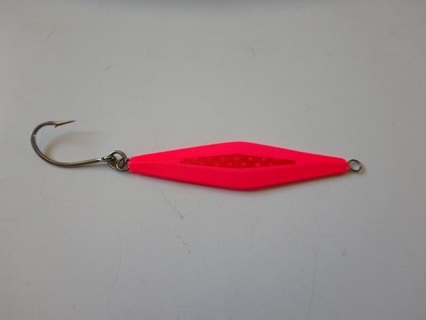 Exceptional lure for kokanee (landlocked sockeye salmon). 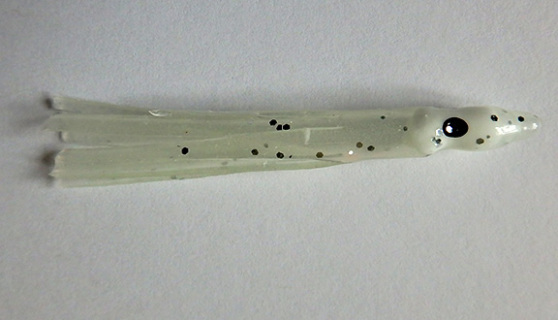 Works great for coho, chinook, pink and blackmouth salmon too. Also super albacore tuna, steelhead, trout, rockfish and bass fishing lure. 2 inch long white rotator with holographic dark stripe that catches colors in the right light. Comes with hook and bumper beads. 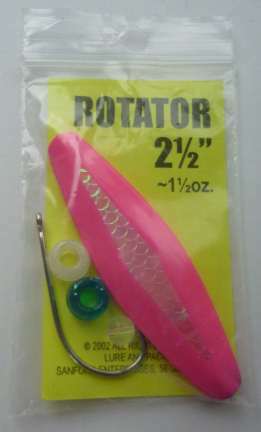 Rotators - the ultimate salmon lure. 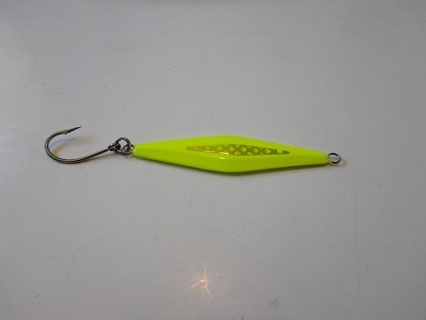 Chartreuse yellow rotator jig 2 inches long with UV stripe. Coho can't resist the action of this jig - works better than a buzz bomb! Other fish love it too! 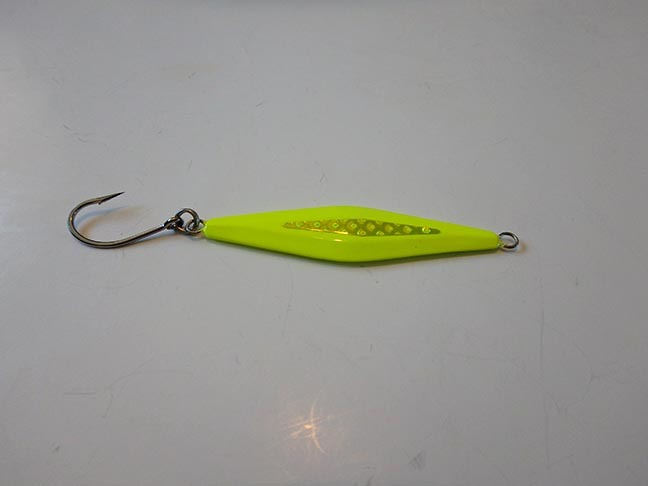 2 inch long white rotator jig fishing lure with green stripe. Comes with hook and bumper beads. Fish can't resist the action of the rotator. 2 inch long white rotator jig fishing lure with blue stripe. Comes with hook and bumper beads. Fish can't resist the action of the rotator. 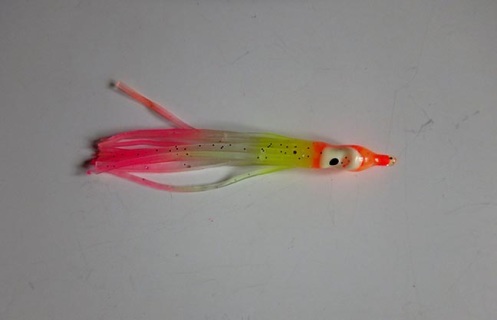 2 inch long white rotator jig fishing lure with yellow stripe. Comes with hook and bumper beads. Fish can't resist the action of the rotator. 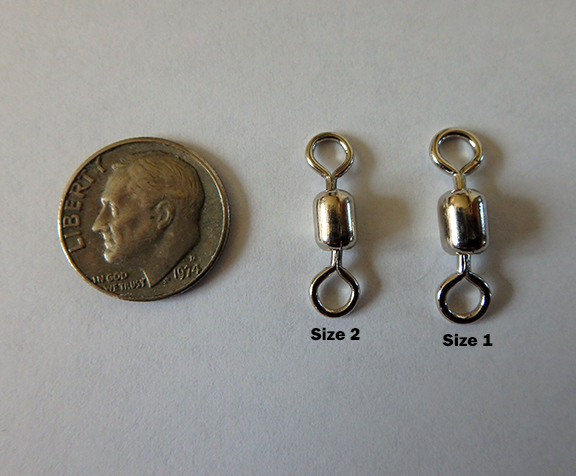 Oval shaped beads 1/2 inch in length. 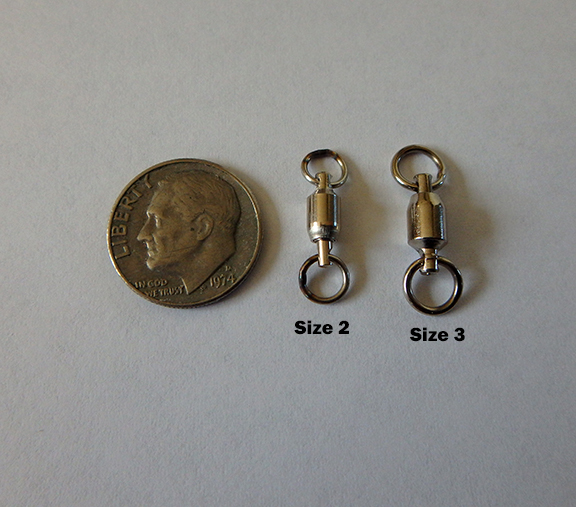 Small diameter holefor smaller lines used with light tackle. Add a skirt to your rotator for extra fish-attracting action. Try all 7 colors with this 7-pack of rotator skirts with 1 in each color. 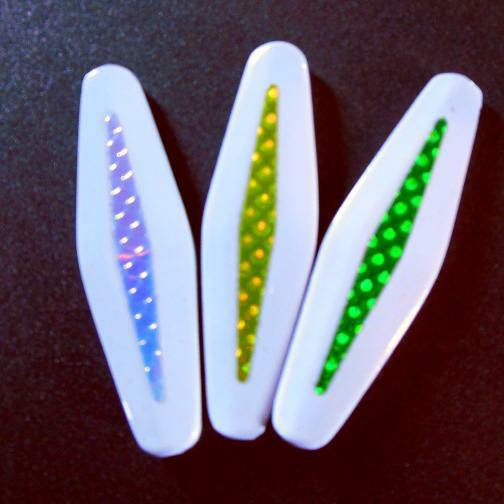 Rotator skirts 5-pack in clear glow color. Rotator skirts 5-pack in Blue color with glow and UV. Rotator skirts 5-pack in Green color with glow and UV. Rotator skirts 5-pack in orange color. Eyes glow. Rotator skirts 5-pack in UV purple color with glow. 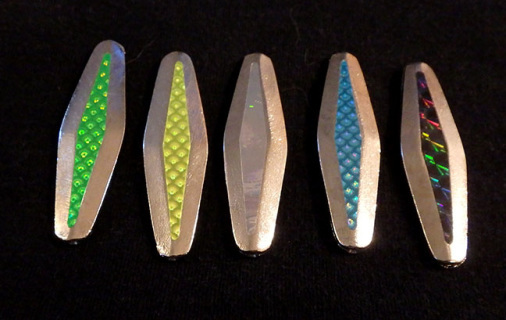 Rotator skirts 5-pack in Popsicle color with glow and UV. 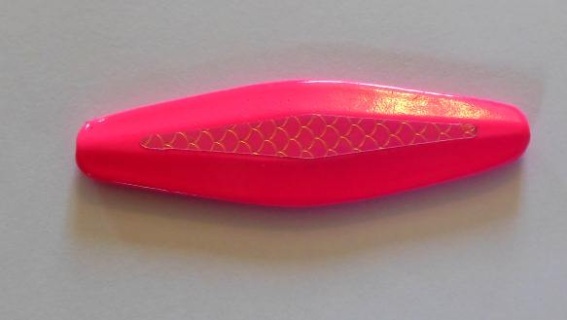 Rotator skirts 5-pack in pink color with UV. Eyes glow. 1 Rotator skirts in Blue color with glow and UV. 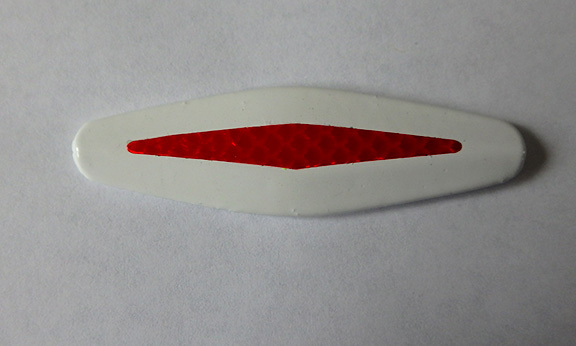 1 Rotator skirt in clear glow color. 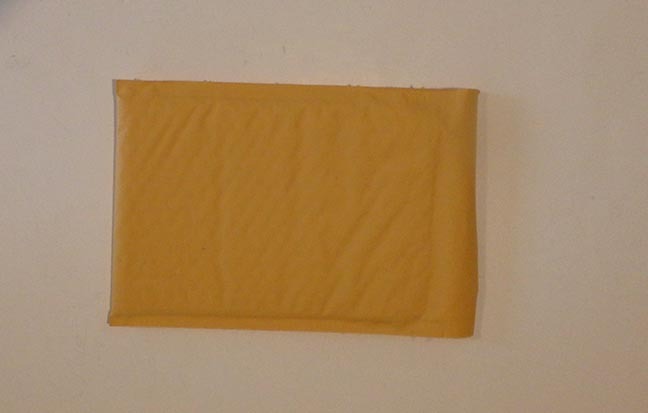 1 Rotator skirt in orange color. Eyes glow. 1 Rotator skirt in UV purple color with glow. 1 Rotator skirt in Popsicle color with glow and UV. 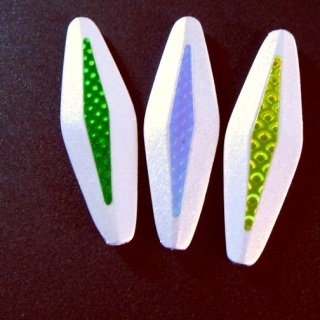 1 Rotator skirts in Green color with glow and UV. 1 Rotator skirt in pink color with UV. Eyes glow. 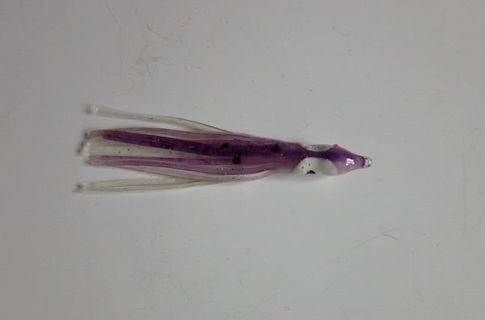 Purple Glow rotator skirt,2.5 inches long with super glow eyes. 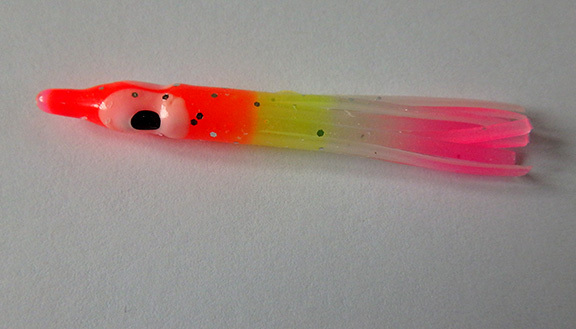 Pink, chartreuse, and orange glow rotator skirt,2.5 inches long with super glow eyes. 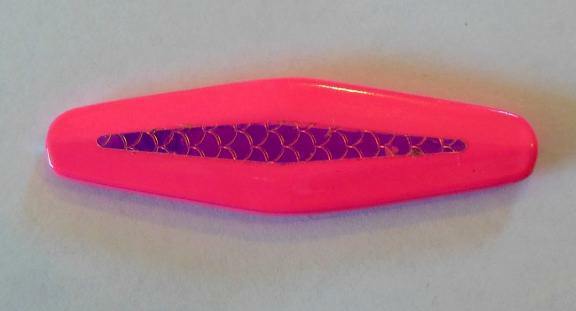 Pink Glow rotator skirt,2.5 inches long with super glow eyes. 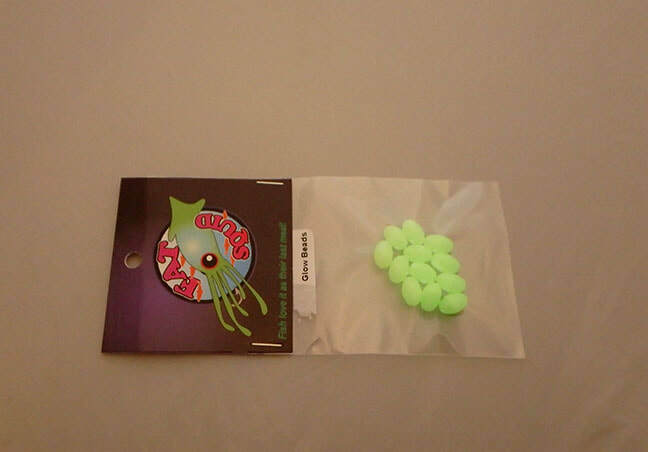 Green Glow rotator skirt,2.5 inches long with super glow eyes. 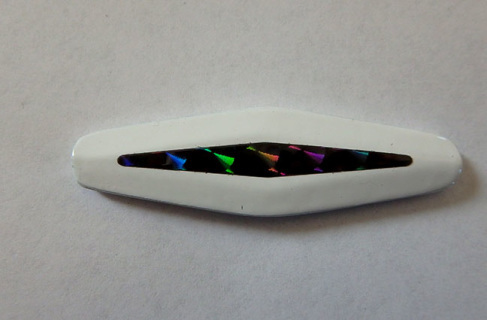 Glow rotator skirt,2.5 inches long with super glow eyes. 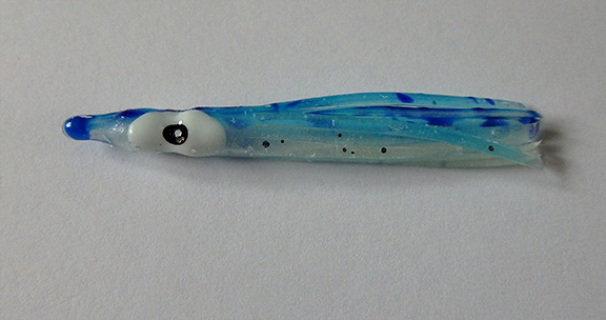 Blue Glow rotator skirt,2.5 inches long with super glow eyes. Yellow sparkly rotator skirt, about 2 3/4 inches long. 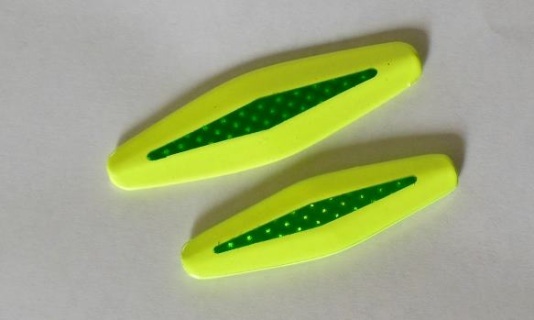 Chartreuse UV rotator skirt,2.5 inches long with super glow eyes. If you are outside the USA, have problems checking out, or don't want to go through PayPal CLICK HERE to shop for rotators.